The Taigen BB RC tanks are of the highest quality and are brand new to the market. 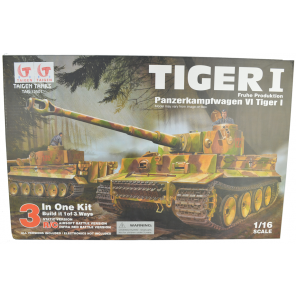 The Tiger I RC tank features a working smoke and sound simulator. It's nearly 2 feet in length with full multi-directional driving, turret swivel and barrel raise and lower. A: Hello - thank you for your question. No, the lifting box (large) does however. A: Hi, Thank you for your question. The length (52cm) includes the barrel.